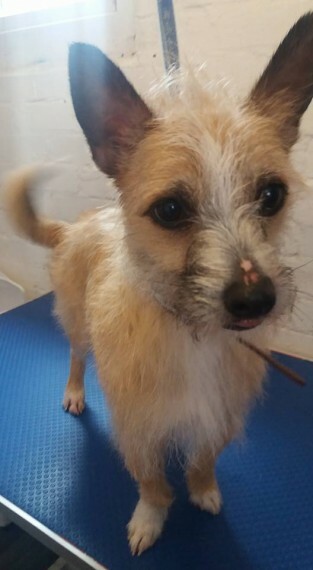 Bailey is an 18 month old terrier cross. he is neutered. vaccinated. micorchipped. flea and wrom treated and will be rehomed with 5 weeks free pet insurance. Bailey was handed into us when his owner could no longer keep him but very sadly it seems like Bailey hasnt had the best start in life. he arrived extremely fearful of the world and rather thin too bless him. Since being in one of our very experienced foster homes he has really started to blossom. He was petrified when he first arrived and really didnt know how to interact with the other small dogs there but as time has gone by he has started to relax more and now has some little dog playmates who are helping to bring him out of his shell. Bailey is particularly fearful of men. especially when they are walking around so he would ideally suit a female only household or maybe a quieter couple with a male in the home who has time and patience to let Bailey build his confidence over time. He really would benefit from having another little neutered dog in the home to learn from and buddy up with. Bailey has been guarding his food bowl .not surprising as he appeared underweight on arrival so his food is precious. so he will need to be fed separately from another dog in the home and just left to eat his food in peace. He is fine taking treats gently. Bailey can be vocal when visitors come into the home or he see..s people outside but there is no malice in this little lad. its just all noise. He absolutely loves his walks and being a youngster he needs an active home who can give him plenty of exercise. He travels ok in the car. he sleeps quietly downstairs overnight with the other dogs and tries to be clean in the house. He will need someone around for part of the day so wouldnt suit a full time working home. Baily hasnt been tested with cats but we doubt he would hurt a feline friend. because he is very nervous he can only be considered in a home with older dog savvy children age 10yrs plus please. Bailey is being fostered nr Market Drayton. Shrops but can be rehomed further afield to the right home subject to homecheck and donation. If you feel you have the right quiet but experienced home to offer this lovely little chap what he needs please email us at .email removed. telling us all about your home offer.